On your round the world gap year adventure, you have a lot of destinations that have you beaming with excitement. A summer spent hiking the Rocky Mountains of Western Canada and an autumn tour of the banana pancake trail through Southeast Asia figures highly on the agenda. As Christmas approaches though, you realize that it just doesn’t feel right to spend Christmas in the tropics, in a culture where the holidays aren’t usually observed or celebrated by the local populace. Besides, there’s nothing like a chill in the air to get you in mood of the season. Knowing that many holiday traditions have their roots in Britain, you have decided to spend Christmas in London; quite possibly with the help of a site like Travel Republic. However, you are understandably apprehensive – you will have just spent a few months in ultra-cheap Southeast Asia, only to be plunged into the midst of Western Europe, which ranks among one of the more expensive places to travel in the world. If you look hard enough, get creative, and exercise some discipline, you can plan a budget trip to London over the holidays and emerge at the other end without serious damage to your wallet.That said, don’t stretch your pounds too thin – life is meant to enjoyed, and sometimes, you just gotta splurge! Chances are, you’ll arrive on a long haul flight from Bangkok or Kuala Lumpur; this may mean you will be arriving at Gatwick Airport. Flights of this nature are often very tiring, so this is a perfect time to pamper yourself in a hotel with first rate amenities. The Holiday Inn, Gatwick Airport is the ideal place to immerse yourself in silky sheets and the softest and most luxurious mattresses you have slept on in months. Additionally, all rooms come with blackout curtains, along with double-glazed windows, keeping intrusions from daylight and noise to a minimum while you recover from your jet lag. After having a proper English breakfast at Traders Restaurant downstairs, or a hearty meal at Hub Bar (much of the food in both restaurants is sourced locally, which is a definite plus! ), head out into London to take in some cheap (or free) Christmas events. First, make for Hyde Park, which hosts the Hyde Park Winter Wonderland. This massive celebration of the season has it all, offering rides, games, ice sculptures, and the biggest ice in the United Kingdom. Admission to the grounds is free; however, prices to skate can be high during peak times, so arrive early to get on the ice for off-peak fares, starting at £10.50 per person. Next, head for the Southbank Christmas Market, one of the more highly-regarded markets in London. Here, find a cute craft for a secret Santa exchange with your travel mates, and knock back some mulled wine to conjure up some of that holiday spirit. Finally, that mulled wine has got you craving an epic night out in one of the best cities in the world for pubs. 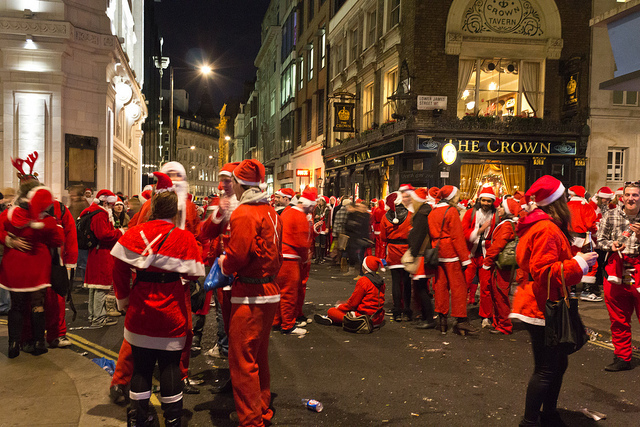 To that end, 1 Big Night Out offers a Christmas Pub Crawl on weekends leading up to the big day. It does cost about £26, but it comes with your very own Santa hat! Few cities in the world do Christmas better than London. If your round the world trip has you abroad during the holiday season, head to jolly ol’ England and you’ll be sure to have a Christmas worth bragging about!